Vector drawing app that generates Obj-C and Swift drawing code. Is there a better alternative to PaintCode? 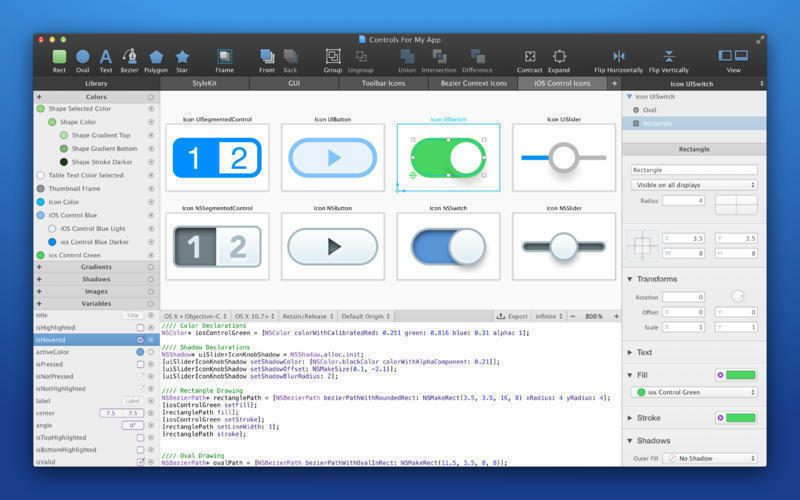 Is PaintCode really the best app in Developer Tools category? Will PaintCode work good on macOS 10.13.4? 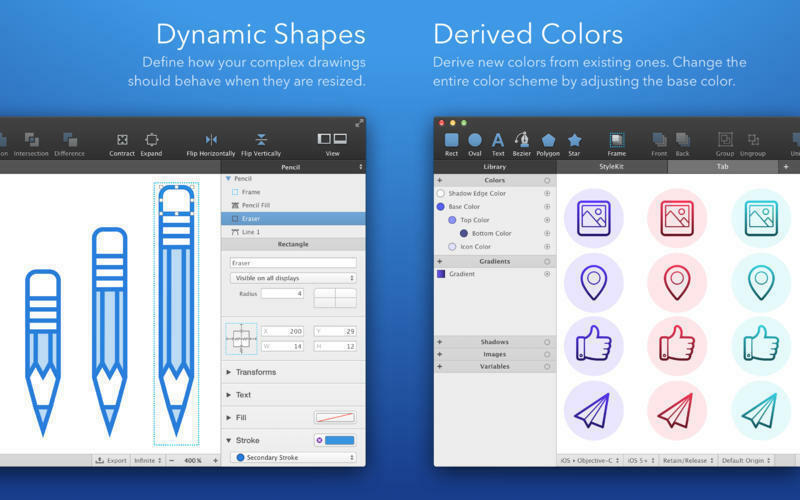 PaintCode is a vector drawing app that instantly generates Objective-C, Swift and C# drawing code. With PaintCode you can create an app that is truly resolution-independent, using code (instead of large number of image assets) to draw a user interface. Stylekit: Change the design of your app in seconds. 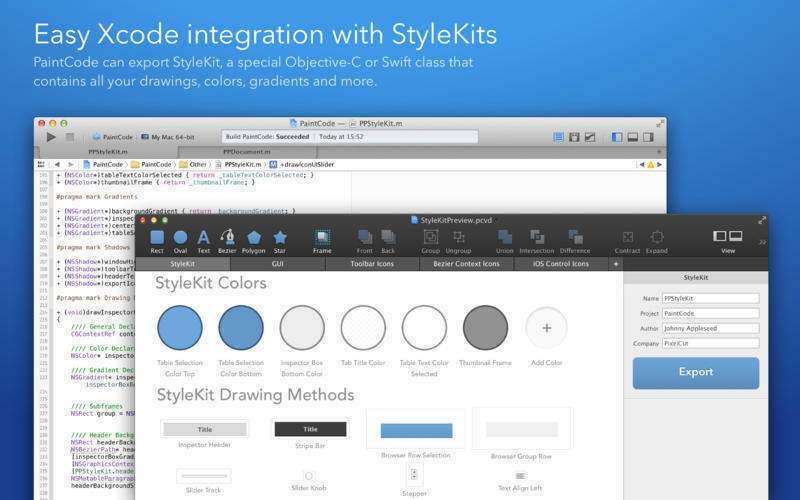 With StyleKits, integration of the generated code into your app is extremely easy. StyleKit is a special Objective-C, Swift or C# class that contains all your drawings, colors, gradients, shadows and other assets. StyleKit can be exported from PaintCode with just a single click, making the design-tweaking process crazy fast. Variables and Expressions: Want to draw a button with multiple states? Circular progress bar? Animated robotic arm? Never-before-seen user interface control? Creating these complex dynamic drawings is usually extremely time-consuming. Not now. PaintCode’s Variables and Expressions let you create dynamic, parametric drawings with immediate visual feedback. Multi-Canvas, Tabbed Workspace (new): Use multiple drawing canvases in multiple tabs. Each canvas turns into a drawing method in the generated StyleKit code. Better Tools (new): Enjoy rotation and scaling with user-defined origin, powerful bezier editing tools, smart and custom guides, precise boolean operations, mass export and import, hierarchical color library, vertical text alignment, better text editing, improved zoom tool, outline mode and many more features. Dynamic Colors: Reuse the same color multiple times across your document. Derive a new color from an existing color, forming a permanent relationship. Changing the base color will also change all the derived colors. This unique feature means you can base the entire color scheme of your app on a single color, which you can easily readjust when you like. 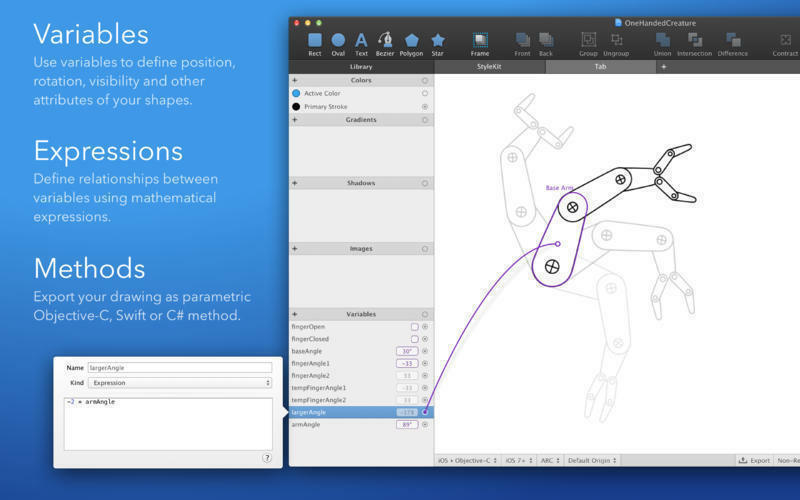 Dynamic Shapes: Define how your complex drawings behave when resized. Draw a resizable button and retrieve drawing code to draw the button to any size. 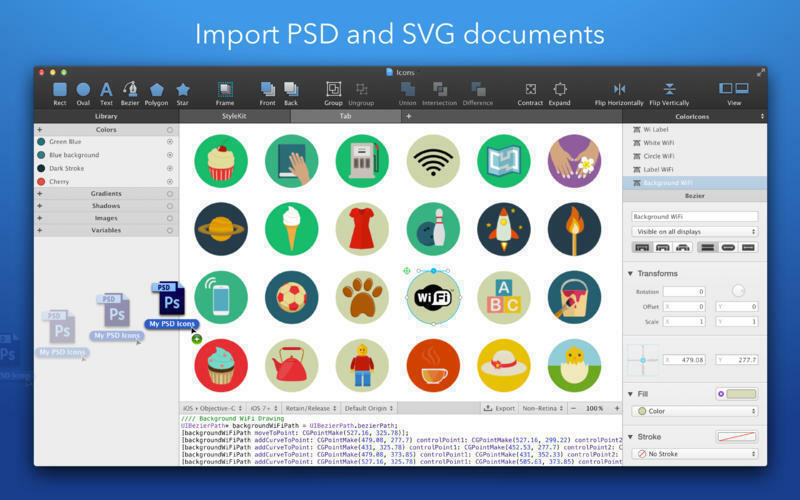 PSD and SVG Import: Import SVG documents into PaintCode, transforming them into Objective-C or C# drawing code. Layer graphics, paths, texts and groups from Adobe Photoshop documents can also be imported. The published price is that of a Personal license. Click here for full pricing info.